Загрузите программное обеспечение DBF Recovery для восстановления DBF-файла. Пресса: The updated version of SysInfo DBF Recovery v3.0 software is now available in the market. 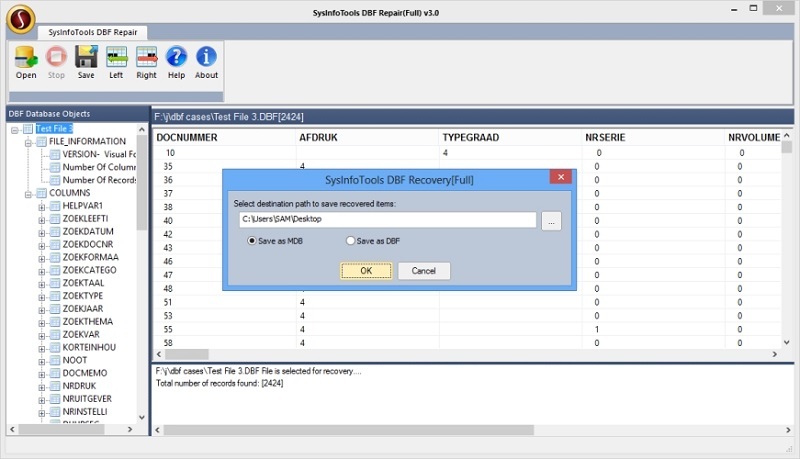 Get the updated version of DBF Recovery tool from SysInfoTools Software. The updated version is v3.0 with more robust and interactive user-interface. Now users can search DBF files in the system by using the auto-search feature. The trial version of SysInfoTools DBF Recovery tool can be freely distributed over the Internet in an uncharged and unchanged form. SysInfoTools DBF Recovery Copyright by SysInfoTools Data Recovery. Your Agreement to this License You should carefully read the following terms and conditions before using, installing or distributing this software, unless you have a different license agreement signed by SysInfoTools Data Recovery. If you do not agree to all of the terms and conditions of this License, then: do not copy, install, distribute or use any copy of SysInfoTools DBF Recovery with which this License is included, you may return the complete package unused without requesting an activation key, within 30 days after purchase, for a full refund of your payment.